The day before my friend Lars and I had planned to explore a section of the California Coastal Trail, a storm system swept through that was cold enough to blanket Kneeland, Liscom Hill and the entirety of the Coast Range with a thick coating of snow. Squalls buffeted our house into the early morning. I could hear the persistent thrumming of rain on our roof at first light. What perfect sleeping weather. This is one of the virtues of involving a partner. If it had just been me, I would have pulled the covers up and enjoyed more time in my warm bed next to my warm wife. And later, I could polish off the remaining dark-chocolate-covered shortbread cookies. But, Lars would be counting on me and alas, the weather forecast suggested improving conditions. I'd been planning since early December to write about the California Coastal Trail, a still-unfinished trail system along more than 1,200 miles of California coastline. About 154 of those miles lie in Humboldt County -- more than in any other county. From the north, the trail enters the county near Ossagon Rocks and Gold Bluffs beach and leaves on low-volume roads headed into the Sinkyone Wilderness State Park of Mendocino County. Peter Jarausch of the Coastal Conservancy told me that the coastal trail in Humboldt "really highlights the rural character of the trail and our stunning natural beauty." Yet, most locals know nothing about it. Redwood National Park Ranger Carey Wells summed it up when she acknowledged that there are "not many users" walking the northernmost section. That's a shame, because this trail-not-taken offers spectacular walking right in our own backyard. The beginnings of the coastal trail can be traced to a 1972 ballot initiative, Proposition 20. It established the state Coastal Commission, required the development of a coastal plan, and created the California Coastal Conservancy. Four years later, the state gave the conservancy the principal role in developing a coastal trail that would provide "a continuous public right-of-way along the California coastline" for hiking and other non-motorized transport. (See www.californiacoastaltrail.info for a more detailed history.) But the trail is far from finished. Lee Otter and Linda Locklin of the California Coastal Commission described it in an article on that website as "a yarn comprised of several different but roughly parallel threads -- here widely separated, there drawn together." One strand may be for beach walkers, another for cyclists, another may be merely a temporary alignment. 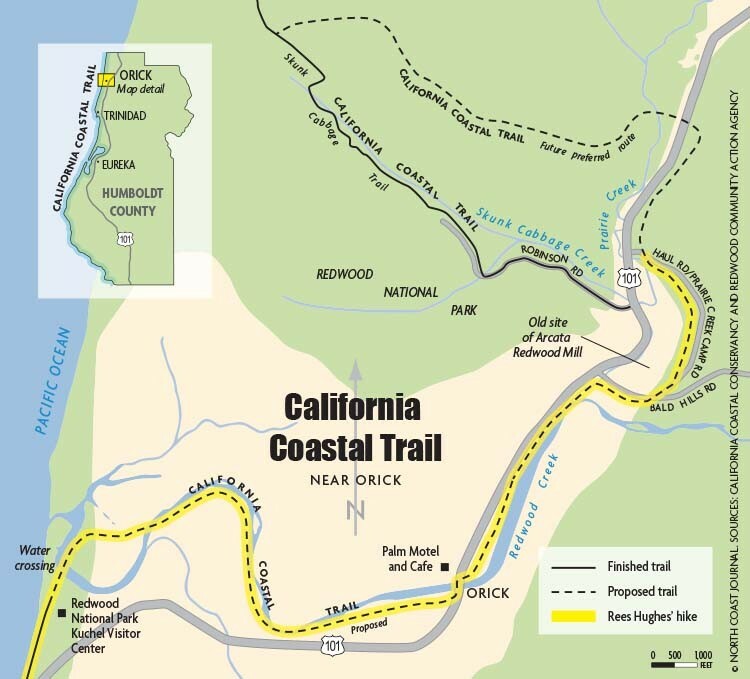 More than 50 miles of the California Coastal Trail here are "inadequate," according to the 2011 Humboldt County Coastal Trail Implementation Strategy, which was prepared for the Coastal Conservancy. The trail makes some extensive and awkward detours, veering well off the coast to avoid private lands. Current alternatives are heavily dependent on walking along highways. For example, you take your life in your hands as you leave the access road to Skunk Cabbage Trail, dodging 101 traffic until you reach the levee system along Redwood Creek through Orick. From Ferndale, the coastal trail is routed south up and over the narrow, shoulderless Mattole Road for 21 miles far from the coast. As the storm slackened on that January morning, Lars and I ventured out to explore an unfamiliar section of the trail both north and south of Orick. I cranked the heat up in the car to give the illusion of it being a warmer day than it actually was. We parked in front of the Palm Café, whose trademark picture windows were partially boarded up. (The black eye, we learned later, was by the inopportune brake failure on a customer's big pickup.) We stuffed our daypacks with rain pants, drinking water and lunch, and headed north along the levee. It was hard not to feel that there had been a lot of brake failures in Orick. Wisps of fog hung in the redwoods that cloaked the hillsides to the east. Leafless alder further softened the landscape. The slate gray Redwood Creek, swollen by recent rains, raced by. Lush greens of every imaginable hue. Out here it was almost impossible to forget what a beautiful place we live in. Jarausch has identified the transition through Orick as a priority project because of the risks pedestrians take to overcome this gap in the coastal trail. This stretch highlights the role that small but critical parcels of private property can play in splicing together a complete trail. After the end of the levee, we danced along the roadside metal guard until we could walk east on the Bald Hills Road to the old Arcata Redwoods Mill site. We crossed the bitumen moonscape of the mill site and walked north along a quiet, alder-lined haul road that eventually intersects with 101. We couldn't help but think that the mill site and haul road would be ingredients of the eventual coastal trail solution. As the morning wore on, the sun was overpowering the clouds and our gloves were no longer necessary. We completed this northern spur of our day's route then retraced our steps to our starting point in Orick. By now fishermen in hip boots were casting from the edge of Redwood Creek. From there, we continued on the levee as it meanders west, bisecting several miles of verdant pasture to the mouth of Redwood Creek. There, we were greeted by watchful seals, their abundance suggesting that they had yet to catch their limit. The sun now reflected off the breaking surf. Oh, what if I had remained in bed! This walk had reminded me of Rich Ridenhour's observation that Humboldt County's coast offers "more pristine coast walking than any other part of California." Rich has helped coordinate annual weeklong 40-mile walks from Carruthers Cove south to Trinidad under the auspices of Coastwalk (www.coastwalk.org), a nonprofit that advocates for coastal protection and access and offers walking tours along the coastal trail. He knows Humboldt County's coastal trail as well as anyone. Rich and I agree that one of the beauties of living nearby is that with a little advance planning (tides, planting a car), every mile of the California Coastal Trail north of the Lost Coast can be done as a day hike, much like Lars and I had done this day. We had walked about 11 miles. My feet were tired but my body felt refreshed. And my appetite was whetted for more. Four days later I headed south. This time, the skies were clear. Next month, I'll offer a glimpse into the southern half of Humboldt County's California Coastal Trail. Rees Hughes, editor of the Pacific Crest Trailside Reader, lives in Arcata. Otters, salmon and eagles, oh my!